Shōwa Kōgaku, later renamed Leotax Camera, was a Japanese camera maker. The company was founded in January 1938 by Nakagawa Kenzō (中川幹三) as Kyōei-sha (共栄社), based in Nippori (日暮里), Tokyo. Nakagawa, a former engineer of Konishiroku, obtained financial support from Minagawa Shōten. The company was renamed G.K. Shōwa Kōgaku (㈾昭和光学) at the end of 1938. The company's most emblematic product was the Leotax, a Leica-style 35mm camera, initially made with an uncoupled rangefinder. However during the early years, the company's main activity was the production of the more pedestrian Semi Leotax 4.5×6cm folding camera. The company became Shōwa Kōgaku Seiki K.K. (昭和光学精機㈱) at some point, certainly after World War II. The Leotax camera switched to a coupled rangefinder in 1947 since German pre-war patents were declared invalid by the USA. Together with the Nicca and the Canon II/III/IV, the camera was one of the main Japanese Leica copies, gradually improved until the late 1950s. 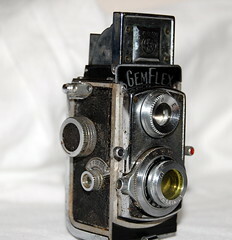 The company was also making improved Semi Leotax models, as well as the Gemflex subminiature TLR. The company was renamed Leotax Camera K.K. (レオタックスカメラ㈱) in 1956 or 1957. It made rangefinder cameras until 1961, the last model being the Leotax G, an advanced camera inspired by the Leica M3. Leotax F with Topcor-S 5cm f/2. ↑ 1.0 1.1 1.2 Sugiyama, p.47. ↑ The name appears in advertisements dated August 1949 to March 1956, reproduced in Kokusan kamera no rekishi, pp.210–2 and 324. ↑ The name appears in advertisements dated October 1957 to February 1960, reproduced in Kokusan kamera no rekishi, pp.324 and 326. Shōwa Kōgaku Seiki. Leotax to Semi Leotax, anata no go-aiyō ni fusawashii kamera (LeotaxとSemi Leotax あなたの御愛用にふさわしいカメラ, Leotax and Semi Leotax, convenient cameras for you). Leaflet published c.1953, date not indicated. Presents the Leotax and Semi Leotax (DL), and has an additional insert on the Leotax S and Semi Leotax R. Document reproduced in this Flickr set by Rebollo_fr.